Active Copier Systems - Active Business | Doncaster. Keeping your business Active 24/7 so it can grow. Call 01302 772 988 so we can help keep your business ACTIVE. Before or after purchase, service is what we do best. With us you’ll get outstanding service tailored to your needs to keep your business running smoothly all day, every day. We’ll provide you with a simple all-inclusive service plan with no hidden costs. And our exceptional customer service and engineer call-out means 99.6% of our customers have never had a single day without a machine in over 8 years! We just want to make your live easy. Call 01302 772 988 so we can help keep your business Active. A reliable office printing and copier system is more cost effective and improves work-flow. So we’ll install a simple and effective system that meets the demands of your day-to-day business. We provide anything from high quality desktop printers to fully managed printing and copier systems. This includes our Managed Print Service (MPS), Scanned Document Management, networking and ongoing maintenance. Based in Doncaster, South Yorkshire, we provide excellent customer service and high quality copier systems to both small businesses and large multi-national companies throughout the UK and Ireland. If you don’t have a service contract with us, and you have a problem with your printing and copier systems that needs fixing, we can help. 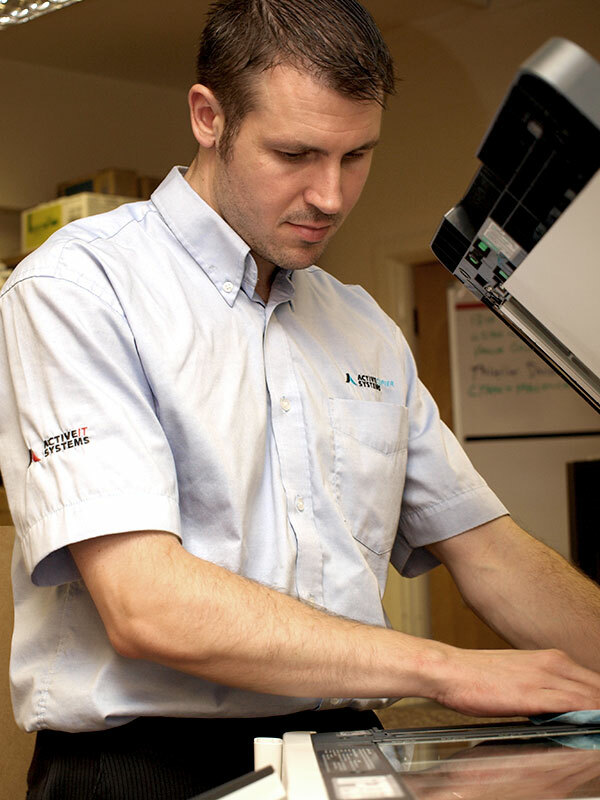 Whether it’s trouble with your network, or you need printer and copier repairs, we’ll either help you fix the problem over the phone, or send out an engineer within 24 hours. Call us on 01302 772 988 and make your business ACTIVE again. We’re experts in copier systems. And we know how to create the perfect system for you. But our 123 Service Guarantee means we can create the perfect system for your needs to make your printing and copier system simple, cost effective and efficient. We guarantee to find the perfect match. Based on your needs, not ours, so it’ll fit perfectly into your day-today business. No fuss.